NO I am not going to be running a marathon but hopefully I shall be walking 26 miles. A girlfriend suggested we did another longÂ distanceÂ walk together as we enjoyed the Oxfam walk Â in 2012. 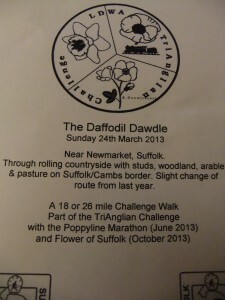 After having a look around I thought we should do The Daffodil Dawdle organised by the LDWA, its starts atÂ Kirtling Village Hall, near Newmarket and theÂ descriptionÂ of the walk is… Through rolling countryside with studs, woodland, arable & pasture on Suffolk/Cambs border. The only thing that concerns me is that the route is not marked, your given aÂ descriptionÂ of the route on the day to follow and we all know how good I am at following a map !! This entry was posted in Events, walking on February 7, 2013 by Sally.